After festival pack-down it was straight on to a line-up of gorgeous Autumn weddings, Bar Mitzvahs, Bat Mitzvahs and more. We’ve been keeping up with some of the top blogs, to garner event inspiration for our bar and bat mitzvah clients. We especially love Best of Bar Mitzvah and TheJC . We were lucky enough to experience the immense talents of Culture Mix Arts. We glittered the steel band musicians for their performance at The Year of Culture 2016 . 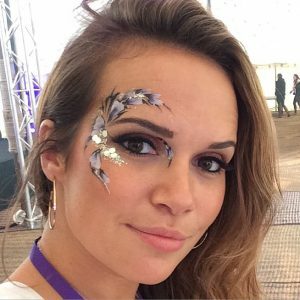 It was a huge compliment that they asked us straight back for more face paint and glitter for their parade at The Notting Hill Carnival 2016. What better venue to tie the knot than Kings Chapel in Old Amersham? We were drafted in to decorate the faces of the bride, groom and reception guests, by highly acclaimed wedding planners Heart Shaped Weddings . We met an old friend in the green room – the superb silhouette artist Mark Conlan. He was also entertaining the wedding party. Other wedding, Bar Mitzvah & Bat Mitzvah venues included Ramster Hall, Battersea Arts Centre and Ham Yard Hotel; all absolutely magical settings. One of our top returning customers, The Southbank Centre, asked us to face paint at their food market last month. We had a ball! Then by night you’d find us at Heaven or G-A-Y . It’s a tireless team. We also squeezed in a big knees-up at Harpenden Rugby Club with a lively and glitter-loving crowd. We’ve been walkabout at 21st, 30th, 40th and 60th birthdays, as well as plenty of teens and under 10’s. We’ve learned that teens are keen on hair feathers and chalks. We’re proud to only ever use ethical, cruelty-free feathers. So don’t hesitate to let us know if this would work for your event. It’s conscience-free! One of our favourite venues for Birthdays this month was Beaufort House. 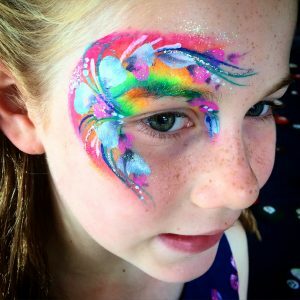 We’ve enjoyed face painting both children and adults at parties there for nearly 5 years now and the staff, food and service are second-to-none. Another returning customer was London Southbank University, where we’re always in heavy demand, this time by a super-keen fresher crowd. We glammed the new kids on the block, ready for their first party weekend at their halls of residence. Everyone at The Glitterbox wishes all those bright, young students a very happy academic year ahead. We didn’t stop at Royston Arts Festival last weekend! We were walkabout for the whole day, as part of a superbly organised celebration of local and historical arts culture. Who knew there was a huge cave running beneath the town? Someone should plan something haunting there for Halloween. Speaking of Halloween…it’s nearly time to unearth the fake blood, creepy contact lenses and prosthetics…let’s get gory! !